How do you teach a horse to endure a saddle on its back and the weight of a rider? In earlier days, horses were ‘broken in’: resistance was met with violence and broken. It was pure physical and, particularly, mental abuse of horses which were scared to death. The American Monty Roberts changed all of that: he uses the horses’ own body language to request their cooperation. They understand what he wants and they cooperate, without being forced. He became world-famous because of this. In the Netherlands, we have our own 'horse whisperer'. He has his own way of backing horses. Without violence or punishment and within less than half an hour. A demonstration by Gert van den Hof has been organised in the equestrian centre in Wanroij (Noord-Brabant) on how to go about backing horses. I am not familiar with the name. There is a stand at the short end of the covered riding hall, but most of the interested parties are standing by the canteen with a cup of coffee. It is January and it is chilly in the hall. The ‘lady speaker’ welcomes all of the visitors and introduces Gert: a man around forty in riding breeches, no spurs, no whip. And he is not wearing a cap. This is displeasing to the hostess, as there are signs everywhere stating that it is mandatory to wear a cap when riding. He is given a cap and a small microphone around his neck. Everyone is directed out of the arena and the first horse is brought in. It is a three-year-old gelding. Gert has never seem him before. The animal is familiar with a halter, but that’s it: he is still green. The gelding is nervous and is glancing around in panic. Gert takes the lead rope and inquires after the descent. The owner gives him the names of the father and grandfather. “He has jumping in his blood” says Gert. He has no further comment. He turns out to be a man of few words. He leads the horse around the arena. 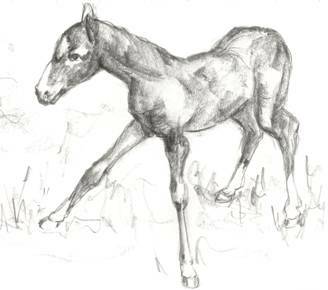 The gelding, eyes bulging, looks around and is startled by everything he sees. With his nostrils wide open, he is blowing with fear. Gert positions the horse in front of the stand. He is handed two horse boots. They must prevent the horse from injury when he proceeds to cut capers in a few minutes. Except for the saddle, the boots are the only equipment that he uses. He glides his hand along the neck of the horse and downward along the left front leg. The horse stamps his foot fiercely. Staying calm, Gert repeats what he just did: Wham! He stamps his foot again. He again strokes the neck and the leg. Again; and again. He does so calmly and without saying a word; he does not get angry once. When the horse eventually stands still, he places the horse boot around the long bone (the lower leg) and fastens the adhesive straps. He then performs the same ritual with the other leg. It doesn’t take as long. He is handed the saddle. Without beating around the bush, he places the saddle on the horse’s back. The gelding stiffens, but it does not move, stiff as a rod from the tension. Gert lets the girth fall on the right side and walks back to the left side. The horse follows him with its eyes, but the animal does not move. The girth is fastened with the buckle. It provokes tension in the horse’s belly; visible from the stand. Gert pays that no heed, tightens the girth and says: “He needs a minute to get used to the saddle”. He then proceeds to lead the horse. The tension bursts out with the first step: the horse cuts capers in every direction; kicks wildly to the front and the back: he must get that strange thing off his back. Gert continues to walk with the lead rope in his hand. He does not look back and the gelding has no choice but to follow. He jumps up again, arches its back, lashes out fiercely; jumps to the left and right. Gert continues to walk through the arena. A few minutes later, the horse ceases his resistance. They walk another round in the arena and Gert then positions him in front of the stand a second time. He tightens the girth a bit more. The gelding does not respond. 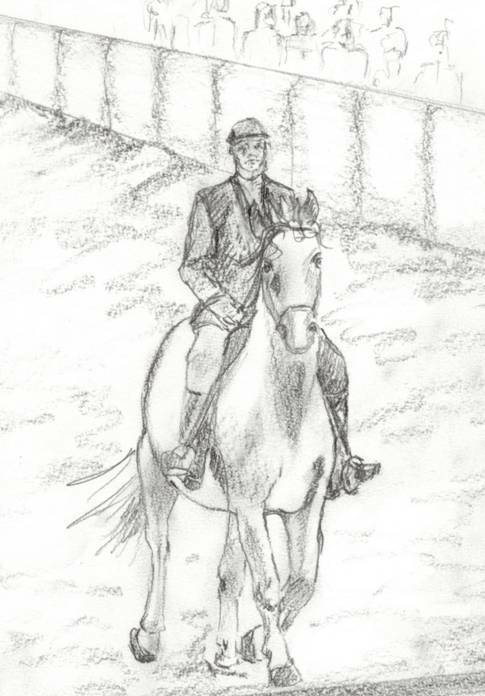 He is standing to the left of the horse and takes the stirrup in his hand; he gives the horse a sideways glance and places his left foot in the stirrup. He turns that foot with the toes pointing to the front, towards the horse’s head: this way, he will not jab the point of his boot into the horse’s ribs. 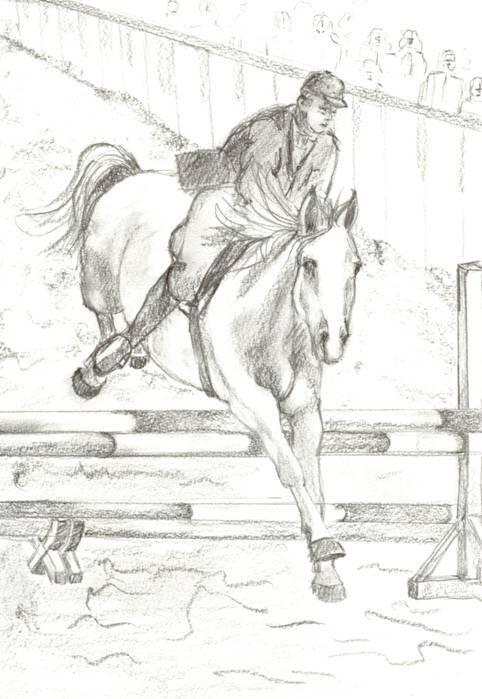 He proceeds to stand in the stirrup, supported by his left foot, holding on the front and back of the saddle. The tension is mounting among the spectators. If the horse were to buck like it just did, Gert will be launched. But the gelding does not move. Gert calmly lifts his right leg over the saddle and places his right foot in the stirrup on the other side. When he sits down, the horse suddenly shoots forward in full gallop like an arrow from a bow, and he starts to buck: his head is lowered, his back is arched and he is jumping wildly: he wants to get rid of the weight on his back. Gert leans forward to lighten the load; he has the lead rope in one hand. He seems to be enjoying himself. As they are storming through the arena, he says through his microphone: “He needs to get rid of some tension. That may take a few more rounds.” He has a grin on his face. Meanwhile, Gert’s role is anything but passive: as they are storming about, you can see that he is steering the horse with his weight: he sometimes positions his rear completely next to the saddle: like a motorcycle racer who hangs next to his machine when taking a curve at a high speed. After about eight rounds, the bucking has diminished somewhat and the gallop is calmer. The horse then gives up; he begins to trot and stops altogether a few minutes later. Gert then sits upright in the saddle. But that is just too much for the horse: when he feels the weight of the rider on his back again, he reacts as if bit by a snake. He is flying around the arena once again. Not for very long this time, as he is tired. When he comes to a halt, panting, Gert is quite satisfied: not bad for a first time. “But he has jumping in his blood, right? Let’s get a hurdle out here.” I do not believe my ears. Backed just fifteen minutes ago; no bridle, no reins. It seems impossible. Two standers and a few beams are brought in. One beam is positioned between the standers at a height of 60 cm; the other on the ground in front of the jump. Gert clamps his legs against the horse’s belly and drives the animal in the direction of the hurdle. There, the horse holds back. He wants to go around the obstacle, first on the left side, then on the right. But Gert does not let up and what do you know: the horse jumps! His feet leave the ground a bit clumsily, all four at the same time almost, but the animal lands on the other side of the hurdle. The audience is speechless with amazement. But Gert feels this is beneath a horse with a descent of his kind and he again drives the horse to make a second practice jump. The animal now understands wat he wants and takes the jump with no visible hesitation. A third, very neat jump follows. Gert is satisfied. “You shouldn’t overburden them the first time.” All in all, less than half an hour has passed. It is silent in the riding hall; no one claps. Not that the performance does not deserve a round of applause; not because it might startle the horse: the audience is so amazed that it forgets to clap. This is like magic. Only Gert finds it a run-of-the-mill thing. He dismounts and strokes the horse’s neck. They walk together to the exit of the arena and he hands the lead rope to the owner. Bewildered, the owner asks how things are to proceed with backing his horse. But Gert finds the question strange: “He is backed now! You can ride him every day from now on. Not too long at first.” The owner is scarcely able to grasp what he just heard. And the hesitation is also tangible among the spectators. Next up is a grey. The mare is six years old. Attempts were made two years previously to back her, but without success: she was unmanageable. She has the studbook predicate 'ster' and the predicate 'voorlopig keur'. Her pedigree (descent) boasts top dressage blood. But she is stubborn. She stamps her feet furiously when the boot legs are put on; the girth around her belly provokes an explosion: she bucks and kicks as if her life depends on it. Gert waits patiently until she has spent her fury. He leads her around a few laps around the arena and tightens the girth: she fiercely resists, again. So he takes her on a few more rounds. He then mounts her. The mare storms off before he has a chance to put his right foot in the stirrup. She frantically tries to throw him off and she is persistent. This does not bother Gert. The mare finally comes to a halt, exhausted, after many ‘wild west’ rounds in the arena. She is panting with her nostrils wide open; her flanks beat back and forth and she has foam all over her body. It is then time for a coffee break. Two more horses are to follow. But I do not stay. I get into my car and drive home in silence. What was shown here, was huge in its simplicity. And having witnessed something huge, I feel small.